Glen Jacobs struggled to find a workable gimmick until Vince McMahon offered him the part of Kane (the brother of the Undertaker)..
October 5, 1997 – Badd Blood – Shawn Michaels defeated Undertaker in a Hell in the Cell match when Kane debuts and interferes! January 18, 1998–Royal Rumble: Kane & Paul Bearer attacked Undertaker and lock him in a casket, then poured gasoline on it and set it ablaze! March 29, 1998–WrestleMania 14: Undertaker defeated Kane after 3 tombstone piledrivers! April 26, 1998 – Unforgiven: Undertaker defeated Kane in an Inferno Match by setting Kane’s arm on fire..
June 1, 1998 – RAW: Kane defeated the Undertaker..
June 15, 1998 – RAW: Steve Austin & Undertaker vs. Kane & Mankind in a Hell in the Cell match ended in a no contest..
July 26, 1998 – Fully Loaded: Undertaker and Steve Austin were victorious over Mankind and Kane to win the WWF Tag Team titles..
Kane & Undertaker eventually became a team and dominated the World Wrestling Federation..
September 6, 1998–HEAT: Kane & The Undertaker defeated Darren Drozdov & Road Warrior Animal. September 15, 1998–RAW: Kane & The Undertaker defeated Steve Austin & Billy Gunn. 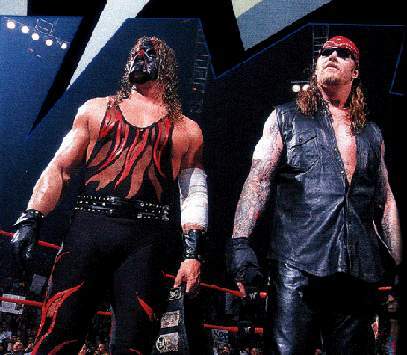 September 20, 1998–HEAT: Kane & The Undertaker defeated The Disciples Of Apocalypse (8-Ball & Skull). September 27, 1998–Breakdown: Kane & Undertaker both defeated Steve Austin for the WWF title, which was immediately held up..
September 28, 1998: The Rock, Mankind & Ken Shamrock defeated Kane & The Undertaker in a handicap match..
October 12, 1998 – RAW: Steve Austin & The Rock vs. Kane & The Undertaker ended in a no contest..
October 19, 1998 – RAW: Kane vs. The Undertaker ended in a no contest in a casket match with the casket was destroyed..
July 12, 1999–RAW: Steve Austin & The Big Show defeated The Undertaker & Kane. August 22, 1999–SummerSlam: Big Show & Undertaker defeated Kane & X-Pac to win the tag titles..
June 8, 2000–SmackDown! : Kane, The Rock & The Undertaker defeated D-Generation X (The Road Dogg, Triple H & X-Pac) (w/Gerald Brisco, Pat Patterson, Shane McMahon, Stephanie McMahon-Helmsley & Tori). June 22, 2000–SmackDown! : Shane McMahon, Triple H & Vince McMahon defeated Kane, The Rock & The Undertaker. June 26, 2000–RAW: Kane & The Undertaker defeated Edge & Christian. July 3, 2000–RAW: Kane & The Undertaker defeated WWE tag team champions Edge & Christian by disqualification. July 6, 2000–SmackDown! : Kane & The Undertaker defeated T&A (Albert & Test) (w/Trish Stratus). August 14, 2000 – RAW: Kane turned on Undertaker and chokeslammed him through the ring! January 2001: Kane and The Undertaker reunited once again..
January 29, 2001–SmacDdown! : The Undertaker (w/Kane) defeated Haku (w/Rikishi). February 1, 2001–SmackDown! : Kane & The Undertaker defeated Rikishi & Haku in a first blood match. February 5, 2001–RAW: WWE tag team champions The Dudley Boyz defeated Kane & The Undertaker by disqualification to retain the titles. February 11, 2001–HEAT: Kane & The Undertaker defeated Taka Michinoku & Funaki. February 12, 2001–RAW: Kane & The Undertaker vs. Edge & Christian ended in a no contest. February 22, 2001–SmackDown! : Christian, Edge & Kurt Angle defeated Kane, The Rock & The Undertaker in a no disqualification match. February 25, 2001–No Way Out: WWE tag team champions The Dudley Boyz defeated Kane & The Undertaker and Edge & Christian in a 3-way tables match to retain the titles. March 1, 2001–SmackDown! : D-Von Dudley, Kane & The Undertaker defeated Christian, Haku & Rikishi. March 5, 2001–RAW: Kane & The Undertaker defeated Haku & Rikishi. March 26, 2001–RAW: Steve Austin & The Rock defeated The Undertaker & Kane. April 5, 2001–SmackDown! : Kane & The Undertaker defeated The Right To Censor (Bull Buchanan, Steven Richards & The Goodfather) in a handicap match. April 12, 2001–SmackDown! : Kane & The Undertaker defeated The Big Show, Funaki & Taka Michinoku in a handicap match. April 17, 2001 – SmackDown! : Kane & Undertaker defeated Edge & Christian in a “no DQ” match to win the WWF Tag Team titles..
April 23, 2001–RAW: Christian, Edge, Steve Austin & Triple H defeated The Hardy Boyz (Jeff Hardy & Matt Hardy), Kane & The Undertaker. April 29, 2001–Backlash: WWE champion Steve Austin & Intercontinental champion Triple H defeated WWE tag team champions The Undertaker & Kane to retain the WWE title, Intercontinental title & to win the tag team titles. May 20, 2001–Judgment Day: Kane defeated Triple H in a chain match to capture the WWF Intercontinental title..
June 25, 2001–RAW: The Dudley Boyz defeated Kane & The Undertaker to win the WWE tag team titles. June 28, 2001–Ohio Valley Wrestling: The Undertaker & Kane defeated Leviathan & Diamond Dallas Page by disqualification..
July 16, 2001–RAW: Kane & The Undertaker vs. Diamond Dallas Page & Rhyno ended in a no contest. July 19, 2001–SmackDown! : Kane, Tajiri & The Undertaker (w/Sara) defeated Tazz & The Dudley Boyz (Bubba Ray Dudley & D-Von Dudley). July 30, 2001–RAW: Kane & The Undertaker defeated The Dudley Boyz in a tables match. August 9, 2001 – SmackDown! : Kane & The Undertaker defeated Sean O’Haire & Chuck Palumbo to win the WCW world tag team titles. August 13, 2001–RAW: WCW world tag team champions The Undertaker & Kane defeated Sean O’Haire & Chuck Palumbo to retain the titles. August 19, 2001–SummerSlam: Kane & Undertaker defeated Dallas Page & Kanyon to capture the WWF Tag Team Titles (Unification)..
August 23, 2001–SmackDown! : WWE tag team champions The Undertaker & Kane defeated Christian & Edge to retain the titles. September 17, 2001–RAW: The Dudley Boyz defeated The Undertaker & Kane to win the WWE tag team titles. September 23, 2001 – Unforgiven – The B.O.D. soundly defeat KroniK in a match that could only be called “Hard to watch”. September 24, 2001–RAW: Bradshaw, Kane & The Undertaker defeated Test & The Dudley Boyz (Bubba Ray Dudley & D-Von Dudley). September 27, 2001–SmackDown! : Booker T & Test defeated The Undertaker & Kane to win the WCW world tag team titles. October 1, 2001–RAW: Booker T, Rob Van Dam & Test defeated Chris Jericho, Kane & The Undertaker. October 18, 2001–SmackDown! : Booker T & Test defeated The Undertaker & Kane. October 22, 2001–RAW: Kane & The Undertaker defeated Booker T & Test. November 29, 2001–WXW: Kane & The Undertaker defeated The APA (Bradshaw & Faarooq). November 3, 2006 – SmackDown! : The Undertaker & Kane defeated Mr. Ken Kennedy & Montel Vontavious Porter..
December 15, 2006 – SmackDown! : The Undertaker & Kane vs Mr. Kennedy & Montel Vontavious Porter ended in a No Contest..
December 22, 2006 – SmackDown! : The Brothers of Destruction defeated Fit Finlay & King Booker w/Queen Sharmell..
October 12, 2007–SmackDown! : The Undertaker & Kane defeated Montel Vontavious Porter & Matt Hardy in a Non-title match..
December 26-27, 2007–House Show: The Brothers Of Destruction (Kane & The Undertaker) defeated Big Daddy V & The Great Khali. February 1, 2008–SmackDown! : The Brothers Of Destruction (Kane & The Undertaker) defeated Big Daddy V & Mark Henry. February 10, 2008–House Show: Kane and The Undertaker defeated Big Daddy V and Montel Vontavious Porter. April 15, 2008–ECW on Sci Fi: The Undertaker & Kane beat John Morrison & Mike “The Miz” Mizanin in a Non-title match..
June 13-14, 2008–House Show: Kane and The Undertaker defeated Montel Vontavious Porter and Mark Henry. November 20, 2009–WWE SmackDown! : The Undertaker & Kane vs. Chris Jericho & The Big Show ended in a No Contest..
May 7-9, 2010–House Show: Kane and The Undertaker defeated Chris Jericho and Edge. April 22, 2013–RAW: The Shield (Dean Ambrose, Roman Reigns & Seth Rollins) defeated Team Hell No (Daniel Bryan & Kane) & The Undertaker.